Open the ww.ireps.gov.in and click on the Help Desk link to open the Help Desk page. Click on the link Request For change of Digital Signing Certificate. Enter the Email Id which is your user id for IREPS application and click on Update DSC button. Choose you new Digital Signature Certificate and click on Select button. Your request will be submitted and you get a Request ID for the same. If your profile already has updated certificate then you will get the message "Your certificate is already updated." Once your request for Digital Signature Certificate updation will be submitted to IREPS helpdesk, they will update your Digital Signature Certificate and you will be log into IREPS application. Please use this option in the case when your DSC has been expired otherwise use the option edit/update your profile link to update the DSC after logging into IREPS application. Kindly provide your IREPS HELP DESK -NEW DELHI OFFICE ADDRESS. No need to visit the IREPS Helpdesk Office, they are already available on phone and email to resolve your problems. You can update your Digital Signature Certificate yourself through edit/update your profile link after login. If you are not able to log in to your account then have to use this option, once you will submit your request then IREPS Helpdesk will update your Digital Signature Certificate. You can add a new new user to your account. I have renewed my digital signature but my properiter name is change how to update in ireps ?? Contact to IREPS help desk for change of the proprietor name. They will ask for the relevant documents to proceed for the name change. i have changed my name ....so how to i change my name in my digital signature cerificate. You need to buy a new digital signature certificate with changed name. intro@jeksonmachinery.com Please update my DSC Request was in hold from last 2 days. IREPS generally takes 3 working days to update the DSC of the users. intro@jeksonmachinery.com requested for DSC Change. Unable to Login panditpautra@hotmail.com. Msg Prompt is Error ADM.008 and Inactive User. Have requested for Updation of DSC. Is there another way to edit/update if I am unable to login. Pls resolve at earliest. What is the approx time for DSC updation? IREPS generally takes 3 working days to update the DSC of the users. 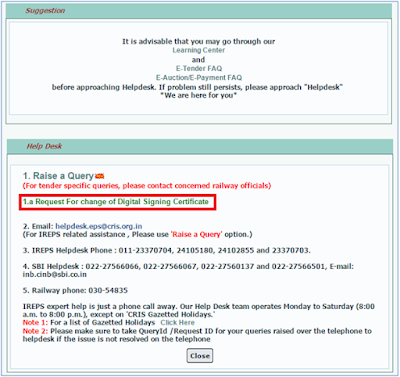 If you are not able to login then you need to contact to IREPS Helpdesk for DSC updation. Hi. My class DSC for e-tender got expired. So i purchased a new DSC from e-mudhra. The certificate has my email written in upper case. When i went to indian railways for mapping/syncing my certificate to ireps, i am informed that since my certificate has email id in upper case and ireps system has email id in lower case, the mapping is not proceeding. When i applied online to e-mudhra for DSC i entered all my details including email in lower case. However e-mudhra stated my details in upper case. i told them to change that but they said that those details are not case sensitive and i wont face any issue with syncing. now my DSC is not getting synced with ireps. what to do? DSC IS REQUIRED WITH FIRM'S NAME AND ITS NOT ALLOWED IN PERSONAL NAME. You need a class III Digital Signature Certificate. Vendors need to have valid Class III Digital Signature Certificate issued by licensed CA with Company Name for participation in E- tenders. There is a hyperlink on IREPS home page clicking on which opens the Controller of Certifying Authority (CCA) website and from there one can access Certifying Authority sites using links provided. Our firm M/s Yolax Infranergy Private Limited is registered on ireps portal with user id- dheeraj@laxyo.in. Since, the registered DSC has been expired so therefore we have requested to change of DSC with request id 55204, but the change of DSC request has been rejected and reason mentioned that, "User name issue in certificate; IREPS registered user name JAY PRAKASH SHARMA and new certificate user name is JAI PRAKASH SHARMA. In regards of the reason mentioned we hereby state that we have registered our Firm on ireps since 2 years ago and after that during the process GST era there is name difference in Aadhar card and PAN card so thats why the changes occur in the name, Hence we request that kindly approve our registration of DSC with modified name. Kindly do the needful at the earliest so that we may participate in etenders. Kindly provide the details to IREPS Helpdesk that why you have change the name in your certificate. You may request to Helpdesk team to update your name in your registered account by providing the required proofs. Once your name will be updated, your request for certificate change will be approve by IREPS Helpdesk. OUR DSC CHANGE REQUEST IS-60698, OUR DSC CHANGE REQUEST HAS BEEN REJECTED.REASON FOR REJECTION-USERNAME ISSUE IN CERTIFICATE.REGISTERED USER NAME:RAMESH RAMAMURTHY AND OUR CERTIFICATE USER NAME: RAMAMOORTHY RAMESH AS PER PAN CARD. KINDLY DO NEEDFUL AT THE EARLIEST. OUR DSC CHANGE Query ID-3021, OUR DSC CHANGE REQUEST HAS BEEN REJECTED.REASON FOR REJECTION-USERNAME ISSUE IN CERTIFICATE.REGISTERED USER NAME:GANDHI SHAMSUDDIN TAHERBHAI AND OUR CERTIFICATE USER NAME: GANDHI SHAMSUDIN TAHER AS PER AADHAR CARD.